The transatlantic crossing of the F-35B for its international air show debut is on hold, as one of the four Lockheed Martin fighters due to make the trip remains on the ground at Eglin AFB, Florida. The other three F-35Bs have arrived at NAS Patuxent River, Maryland, the departure point for their historic Atlantic crossing to the United Kingdom. All four F-35Bs are due at RAF Fairford in England the week of July 7 at the latest to allow pilots time for verification flights for their displays at the Royal International Tattoo and Farnborough air show this month. 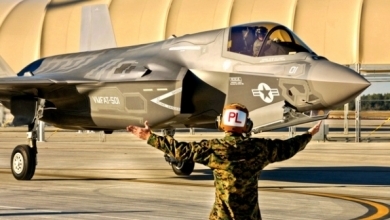 But the fourth F-35B — and perhaps most notable as it is the single British jet slated for the shows — is still on the ground at Eglin following an F-35A fire last week. U.K. defense officials have not yet replied to queries as to why the jet has not transited to Patuxent River. For the complete story by Amy Butler and Tony Osborne of Aviation Week, click here.